FRIDAY THE THIRTEENTH falls on a Facebook Fridays! 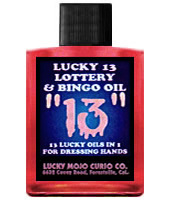 this month -- and the Lucky Mojo Curio Co. is hosting a random drawing to give away thirteen different Lucky 13 spiritual supplies, so February 13, 2015, could just be your lucky day! This week the prizes are a bottle of our Lucky 13 Anointing Oil, four foil packs of our Lucky 13 Bath Crystals, four foil packs of Lucky 13 Incense Powders, and four foil packs of our Lucky 13 Sachet Powders, hand-made to bring reverse bad luck into your service! First thing tomorrow morning, we will select THIRTEEN winners at random, announce their names here, and ask them to message this Facebook Page with their mailing addresses, so we can send them their FREE Lucky 13 products. Thanks for posting this, Ernie. Folks -- be sure to enter the giveaway! We have a winner! In fact, we have 13 lucky winners! Our Facebook Fridays! winners for February 13, 2015 are: Cecile Devine, Tom Jenkins, Denise VonMillanich, Maynor Varela, Beccah Garrett, Dawn Rough, Rebecca Granados-Gupton, Debby Johnson, Leesa Kern, Jessica Main, Christian Hanson, Sasha Georgiades, and Ashley Rheiner.